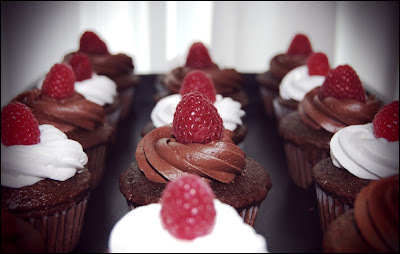 So the quest continues, in this edition of WCD I tackle some super fantastic Dutch Chocolate Raspberry cupcakes. The cupcakes turned out quite good if I do say so myself, nice and moist and flavourful. With fresh raspberries inside! Anywho, keeping this short today but I promise I will try and post a little more regularly from now on...notice I said "try"
I'd love to have the recipe for these, they look very yummy!